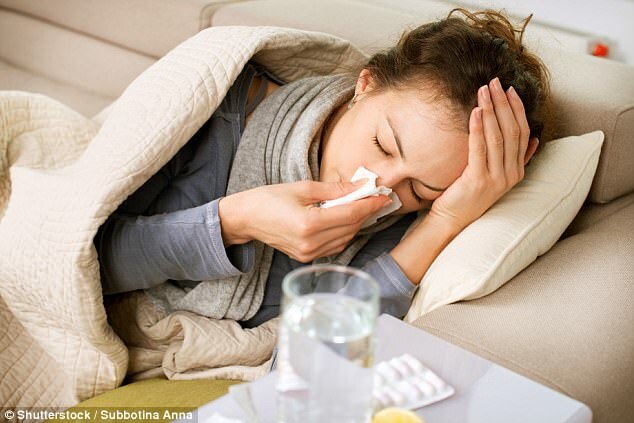 The deadly 'Aussie flu' currently sweeping Britain has already claimed lives in Ireland, it has emerged. Doctors in the UK have warned that it could be the worst outbreak of the bug in 50 years, as official figures revealed cases more than doubled in just one week. Government statistics show 1,111 people were struck down with flu as temperatures dropped last week - a 156 per cent jump on the previous seven days. Although the number of flu-related deaths recorded in Ireland so far is under ten, 73 people have been hospitalised and the Irish Health Service Executive is urging people to get vaccinated. In a statement, the executive said the number of reported cases of flu had increased in the week before Christmas and that flu 'is now actively circulating in Ireland'. Director of the HSE's Health Protection Surveillance Centre Dr Kevin Kelleher told RTE the executive has been informed of a 'small number of deaths directly related to influenza (less than ten)' in the last two weeks. The executive is urging people, particularly those in high-risk groups, to make sure they are vaccinated. These include people aged 65 and over; anyone with a chronic illness; all pregnant women as well as people in care homes or long stay facilities. Meanwhile, figures released by Public Health England show a sharp rise in cases, triggered by a surge in two aggressive subtypes attacking the population simultaneously. Experts fear the virulent flu strain, which has now reached the UK, could prove as deadly as the Hong Kong flu in 1968, which killed one million people. But last week 522 cases of influenza A and 546 of influenza B were recorded across England and Wales. Some 43 cases are yet to be identified. Cases this year are almost 10 times higher than they were at the same point in 2015, according to the PHE data. Just 132 cases were recorded then. But in 2015, Government figures suggested that the winter flu played a part in more than 16,000 deaths. Only 577 deaths were recorded in the previous winter. The total recorded in week 51 is also double that of last year, when 583 cases, mainly of the H3N2 subtype, were reported. Earlier this month, NHS Providers, which represents hospital trusts, said hospitals will be 'sorely tested' this winter. Its comments were provoked by chief executives of two hospitals who admitted their bed occupancy rates are 98 per cent and 99 per cent respectively. And concerned doctors warned patients will have to 'sleep, take paracetamol and pray' ahead of the impending winter crisis. The NHS is expected to face unprecedented pressure in the coming months, as campaigners fear it will be disastrous amid soaring waiting lists in A&E. The worries follow last year's winter crisis, which saw health secretary Jeremy Hunt beg people to stay away from turmoil-hit hospitals. The Red Cross branded the situation a 'humanitarian crisis' - a term used to describe the devastating civil war in Syria and Yemen. Some 2,117 people have been infected with norovirus since July. The figure has raised at a steady level week-on-week since October. Nick Phin, of PHE, said: 'Flu activity, as measured by a number of different systems, has continued to increase in the last week or two. 'This is to be expected as the season progresses and at this point the numbers are in-keeping with previous years. The PHE figures follow repeated predictions by researchers that the flu vaccine may only be 20 per cent effective this winter - just like last year. 'There is no point in trying to close the borders. It’s almost inevitable this will come to us.